It’s not that I have forsaken cooking in pursuit of other, more easily acquired (and dare I say wanton? ), meals. I haven’t. Sure, the occasional Chinese food delivery threatens my resolve, and the even less frequent meat loaf sandwich convinces me of my own culinary inadequacy, but I do still cook. Unfortunately, prolific eating does not always lead to prolific writing. On the contrary, my food-induced comas compel me to do very little of anything, which is further indication that my restaurant reviewing career would not be especially promising. (Unless Instagram-friendly reviews were considered pithy rather than lazy.) Similarly, the food I eat out does not always inspire me so much as enable me to continue eating out. So, my homemade meals of late have been basic. Vegetarian. Wholesome. I am still wholly capable of making indulgent foods, but mine is a city of indulgences, and sometimes I just crave simplicity. And that’s what home is for these days. 1) Preheat the oven to 350 degrees. In a pan, heat olive oil to medium heat, then add eggplant and garlic. Cook until browned and slightly tender, then season with a pinch of salt and a teaspoon of oregano. 2) Pour eggplant into an 8 x 8 inch glass or ceramic baking dish, then cover with diced tomatoes, salt, pepper, and remaining oregano. 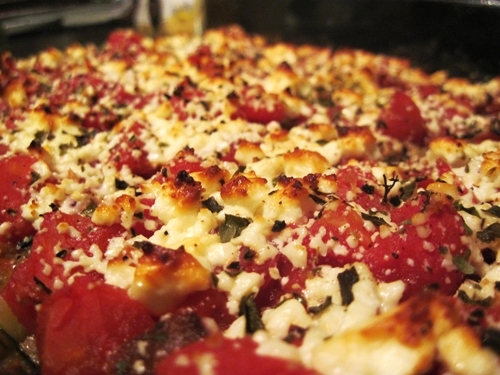 Sprinkle feta on top, then cover the dish with foil. Bake until cheese begins to melt (25 to 30 minutes). 3) Meanwhile, prepare the polenta according to the package’s directions. 4) Remove the eggplant dish from the oven and let it sit for 10 minutes. Heat a pan to medium heat and grease with butter or olive oil. Slice pieces of polenta and fry on each side for 2 to 3 minutes. 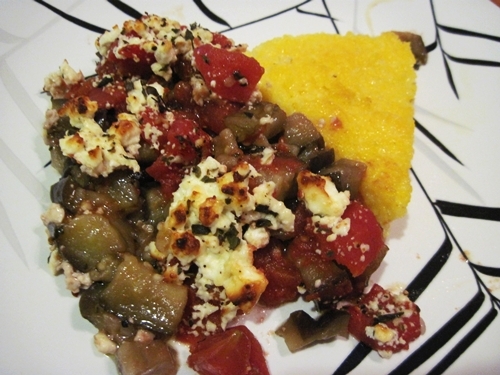 5) Place polenta on a plate, then top with eggplant and tomato dish. Serve warm.